Self-guided and self-paced tour; spend as much time as you want exploring "the Rock"
Book reservation at $150.00 per person in our order system. The price includes the $39.90 per person Alcatraz ticket. We have a maximum of 8 to 16 Alcatraz package tickets available per day. Reservations are combined into small groups that departs together. You will be emailed a confirmation of your Wharf and Alcatraz Segway Tour reservation. The Alcatraz boarding tickets will be held for you at Alcatraz Ferry Will Call at Pier 33. All guest names must match the reservation when picked up. Segway tour is 2.5 hours and suggested time on Alcatraz is at least 2 hours including enjoying the award winning audio tour of the cell house. Daily 9:30 AM Wharf and Waterfront Segway Tour and Alcatraz Island tickets for early afternoon (eg. 3:50 PM) OR 1:30 PM Wharf and Waterfront Segway Tour and Alcatraz Island tickets for early morning (eg. 8:45 AM). Your narrated "Alcatraz Tickets plus Wharf and Waterfront Segway Tour" will feature spectacular views of San Francisco Bay. Your experienced and fun tour guide will narrate your tour through a compact single ear-bud sound system. Each guest is issued a compact radio receiver. 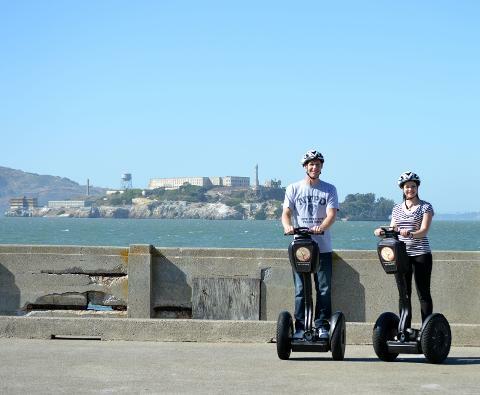 The Segway Tour route follows the waterfront and allows guests great views of San Francisco Bay and the City Skyline. After a 20-30 minute training session on how to safely operate the Segway, you will explore the San Francisco waterfront for two hours.. Your experienced and fun tour guide will narrate your tour through a compact single ear-bud sound system. Each guest is issued a compact radio receiver so they don't miss a detail of what the guide is saying about each site seen on the tour. Numerous stops are made for photos - so don't forget your camera. Your Segway Tour will be either at 9:30am or 1:30pm depending on your tour departure time. Your Alcatraz portion will either lead or follow your segway tour depending on your Segway tour departure time. Begin your trip to Alcatraz at Pier 33, where you will board the ferry at the Alcatraz Landing for a ten minute cruise across the San Francisco Bay to Alcatraz Island. This former federal penitentiary was home to the likes of Al Capone, George "Machine Gun" Kelley, and Robert "The Birdman" Stroud. In addition to housing the famous prison, Alcatraz features some of the most spectacular views of San Francisco and the Golden Gate Bridge. The National Park presents a captioned orientation video with historical footage, self-guided walks, exhibits and Ranger-interpretive talks on topics such as "Famous Escapes." Also featured is the Award-winning audio tour in the prison Cell House featuring actual interviews of former guards and inmates. The audio tour is available in six languages: English, French, German, Italian, Japanese and Spanish. After the tour, there is time to visit the Alcatraz Museum, the bookshop and explore the island. Stay as long as you like. Ferries depart every half hour back to San Francisco. Alcatraz Tour Length: Average time spent on Alcatraz is 1.5 to 3 hours.